A course is the training product delivered by your organisation. For example: Dancing for Beginners, Advanced Jewellery Making or MYOB for Professionals. A course can be given any course code to identify that course uniquely. A class is the instance of a course run at a particular time and date, led by one or more tutors and with a group of students enrolled. Classes may meet for one or more sessions depending on the subject outline and timetable. Classes are the things which you sell (or give away for free) and into which students enrol. To access the course records go to either the splash screen and click on Course or the onCourse menu Products → Courses . This will open the Course list view window. 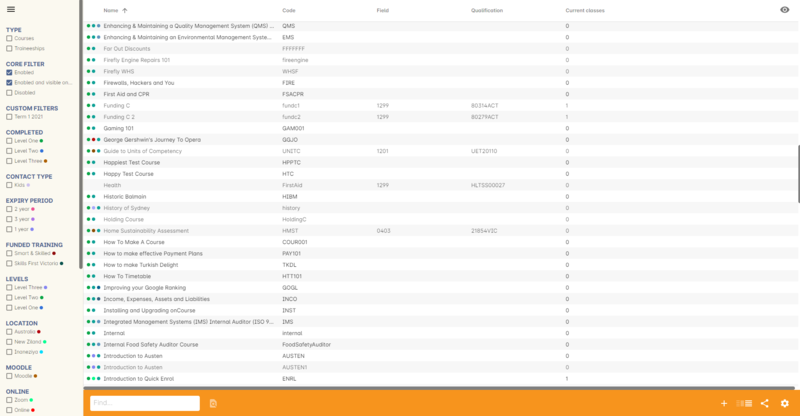 Parts of the window - On the right hand side of the window are the course records listed in a summary view. The title bar shows you how many records you have. The top section of the window contains the search function and the add and delete records button. You will also find a cog wheel button that allows for special functions for one or more records in the list. In the left hand side of the list window are quick searches to enable you to work with groups of data. Quick Search - By typing the first few letters of the course name into the quick search field, you can reduce the list of records to those that match. Advanced Search - can be accessed by clicking on the Magnifying glass image in the quick search field. This will open the query editor to allow you to choose which fields and which data you want to search on. You can add multiple criteria to your searches. Saved Searches - After performing an advanced search, you can choose to save the search parameters to allow you to quickly run the search again. To save a search, click on the cogwheel within the query editor and select 'save find'. The saved search will appear in the left hand part of the window and behave as a filter. Tag Groups - Any tag groups you have created that relate to courses, like Subject, will appear here. By checking any of these check boxes you will see the list of records on the right hand side reduced to records that match that criteria. You can tag records in bulk by selecting a group of records on the right and right clicking on a tag name on the left. Core filters - reduce the list of records to those that match the filter criteria. By default, most onCourse windows open with filters applied so you are only working with your current records. You can switch core filters on and off by ticking the checkboxes. You can enter a course record by double clicking on it in the window. 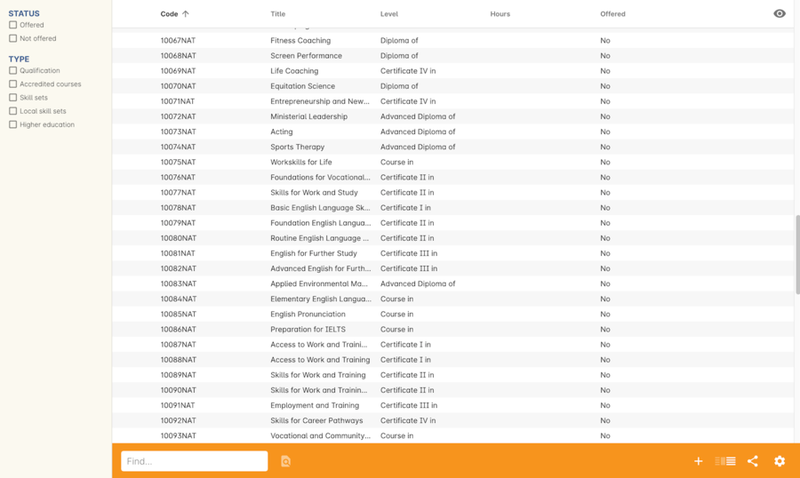 From the list view, the course cogwheel allows you to Show or Remove courses from your onCourse website in bulk. Courses which are not shown on the website appear in a lighter grey font in the list view for ease of identification. The course cogwheel also lets you duplicate a course. This copies all the marketing and attached record data from a course into a new course with the same name and a '1' added to the end of the course code. The feature is of particular use when a training package updates and course units need to be adjusted for future enrolments. A course is the subject being delivered. Courses are your college's product. They are what your business sells. They may be accredited or non-accredited, part time, full time or just one time. For example, a course might be Jewellery Making for Beginners, a Diploma in Business or MYOB for Professionals. A course can have many classes and each class can run for one or more sessions. By setting up courses, you have something to advertise. You will need to name and describe your courses in order to entice your students to enrol. Student enrol in classes, but can add themselves to the wait list for courses. You need only enter the course name and course code to create your courses in onCourse, you can return to the record later more information, like a description for your website or print marketing. Click on the + button in the top right hand corner of the screen. A new course screen will open on the general tab. Enter a name for your course and a course code in the relevant fields. Your course code must be unique, that is a code not used by any other course already created. Please note that the course code must not have any spaces between characters. So the course code for 'Dancing for Beginners 1', written using the first letter of each word, must be entered as DFB1 and not DFB 1. If you want students to be able to go on the waiting list for this course check the allows waiting lists box. The Enabled option will be selected by default. This allows you to create classes for this course. If you want to show this course on the web, change it to Enabled and visible online. If you decide to retire this course from your list of offerings you can change this to Course Disabled. Courses that are disabled can not have new classes created for them and are hidden by default by the core filters in the list view. There are two choices of enrolment type that relate to enrolments processed over the website. Open enrolment means students can enrol and pay directly on the web. This is the default setting. Enrolment by application means there is an approval required by your office staff before a student is offered a place and can enrol and pay on the web. Set the enrolment type appropriate to your course. All classes from this course share an enrolment type. Below is the print brochure description box. There are two options for entering descriptions: print brochure description on the general tab, and web description on the marketing tab. Usually, print materials are limited to descriptions of two or three lines, whereas on the web, your space is unlimited. If you do not intend to use onCourse to create a print based brochure, you do not need to enter any information in the print brochure description field. Text entered here can later be exported in an XML format ready for import into a print design product like Adobe InDesign. Move to the marketing tab. Text entered in the web description field can be written in rich text format. A guide to using rich text can be found here found here You can preview the text by hovering over the blue A at the bottom of the text field. You can also attach images, files or documents to the web page. To advertise this course online, select Enabled and visible online in the general tab. The Notes tab can be used to add internal notes about the course that will not be published to the web. During the course set up stage, there will be no information available in the timetable tab. After you schedule some classes you will see them on this tab. When you have entered your information, click save and you will be returned to the course list page. Notice that the course you have entered is now listed. You can return to edit this course at any time by double clicking on it. You will notice that before entering text, the course and code box is coloured pink. Once you have entered valid text the colouring disappears. Should the box remain pink, it means that you have not entered the text correctly and need to review your entry. You will not be able to save the record as the save button will be disabled. There will be a warning icon that will provide you with information as to why the data you have entered is not accepted if you hover over it. After a course has been created, you can create it's classes. Classes can be created from the class window as mentioned in the Classes chapter. You can also create classes from inside the course record. Click on the + inside the course general tab to create a new class. On the course general tab you will see by default all the current and future classes for this course. Untick this option will display the past classes also. If students have been added to the wait list for a course, a count will appear on the general tab. The open related record icon will open the waiting list entries for these students, allowing you to contact them or edit their preferences. onCourse allows you to link related courses and products to a given Course. This is an invaluable tool from a marketing perspective as it enables you to cross sell related or similar courses. Go to the Marketing tab of the Course and click on the + symbol to create a new Course relationship. Enter the name of the Course / Course code and click ok within the dialogue box. There are no limits to the number of related Courses you can add, but a maximum of 4 courses will display at any one time under the 'Related Courses' heading on the website. You can also add related products, vouchers or memberships to a course to encourage their purchase. A related product may include the course textbook, a related voucher may be a bundled set of courses that includes this one for a special price, and a related membership may be one that provides a discount on enrolment in this course. Any related Courses that you set up must be web visible and open to enrolments in order to display with the original course on the website. You have the ability to add thumbnail images to all your courses. These will appear on your website on any courses list view page, so that's any URL that contains /courses after your domain name e.g. www.acme.com.au/courses or www.acme.com.au/courses/business/computing. More information about it can be found in the attachments chapter of the web manual. You can view all of the Qualifications and Modules/Units of Competency (including skill sets) by opening the Qualifications window, either via the Dashboard, or by clicking Training > Qualifications in the nav menu. 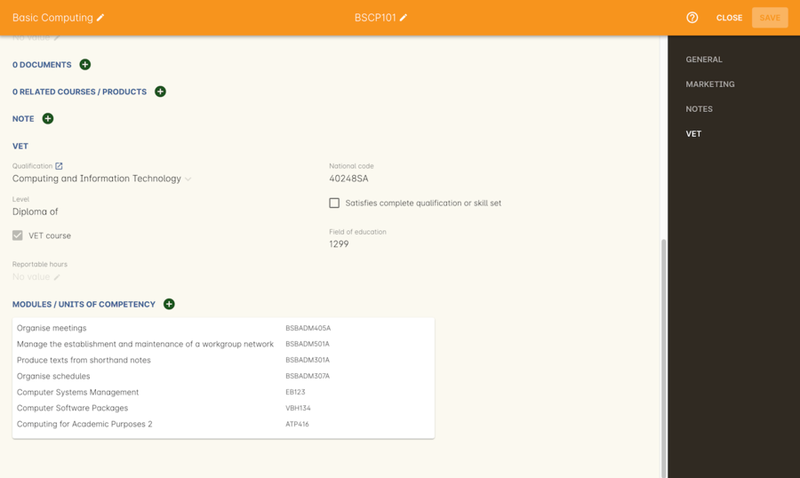 This has been merged with the Unit of Competency window as well, so all of these are able to be viewed and reviewed together in the one place. You can switch between the three-column view or a list view by selecting the switcher at the bottom of the window. The onCourse website is a powerful marketing tool for promoting your products to the public. Your ability to explain your product point of difference and entice students to enrol is determined by the copy you write in your course Marketing tab. The first sentence or two of your course description should contain your hook. 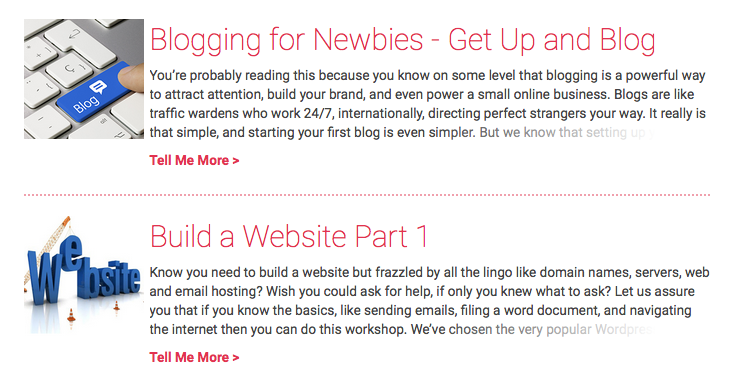 This is the copy that displays in the course list results and 'reels in' the customer, enticing them to click on the link [more...] Avoiding using headings in the first paragraph for the same reason - it won't render well in list views or make sense to readers browsing your site. Think about all the questions potential students ask about this course, and provide answers in the course copy. onCourse already helps answer the 'where and when' questions with google maps embedded, and a full class timetable. It's the internet - there is no limit to the amount of information you can provide. Give students full confidence that this is the right course for them so they can click 'enrol now', instead of having to pick up the phone to ask you for more information. An image is worth a thousand words. Show, rather than tell, what your students can achieve if they enrol in this course. Learning Thai Cooking? Show them a dish they will cook in class. There are a thousands of enticing stock photography images available for purchase online, and the onCourse system makes it easy for you to attach them to a course and upload them to your website. Keep the technical language to a minimum. If you are selling vocational training it's easy to fall into using acronyms and terms that only make sense to people within the industry. Your potential students are here to learn - don't scare them off enrolling by assuming they have the same industry knowledge you have. Avoid negative language. Your course description is not the place to tell people they can't access refunds if they change their mind after enrolment. Save it for your Terms and Conditions page. SEO stands for Search Engine Optimisation and having a website with 'good' SEO should mean your site appears near the top of the list for searches that are most relevant to your product. A large part of SEO is technical - i.e. can the Google bots that crawl the internet read and understand your website's content? The technical framework that underpins the onCourse web engine does most of this hard work for you, but one thing we can't automate is the creation of your website content. There are plenty of companies out there who will try to sell you an SEO solution, but the one thing most of them lack is an experienced copy writer who knows your product and your market. Writing enticing copy is a skill. Making sure this copy hits on appropriate keywords and still reads well is an art. Keywords are the terms people use when they are searching for your product. If you have an AdWords account with Google, they have an excellent Keyword Planner tool that allows you search for keywords and find related terms people search for, with their relative search frequency. The first paragraph of text on the page should reuse your primary keywords and add in your top related keywords, while remaining readable to humans. Say for example you chose the primary keyword Microsoft Office Excel with related keywords MS excel, formulas, spreadsheets, help, online, free, and your generic location. Your first paragraph would read: "Our Canberra CBD courses in Microsoft Office Excel are the solution to learning excel formulas and other spreadsheet functions. MS Excel training will help progress your career in almost any industry. Online classes for Excel are also available or you can attend classroom tutorials and then access our online Excel course for free." If you're selling education, keywords like learn, course, class, training and tutorial belong in every course description you write. If you're selling face to face training, make sure you use location based keywords that relate to your training venues in the course copy, don't just rely on the class location to 'sell' to the local market. Encouraging people to link back to your content is also a great way to improve your native page ranks. onCourse websites have built in tools for AddThis, but to encourage links you need to provide content worth sharing. Consider providing content beyond the sales pitch - some Excel hints and tips may be just the trick to keep visitors returning. If you are an RTO who offers short accredited programs, or full qualifications, you will appreciate the ease in which you can set up your courses with the right unit and qualification details. This then flows through to recording outcomes, creating transcripts and certifications, and generating AVETMISS compliant data. In this section when we talk about Qualifications we really mean "Qualifications, Accredited Courses or Skillsets". And when we say "Unit of Competency" we also include "Modules". Although the words are different between state and commonwealth accreditation regimes, the processes in onCourse are exactly the same. You must ensure that in the File > General > Preferences > AVETMISS you have the 'show RTO related screens and menus' option enabled. This makes the VET tabs in the course and class records and the AVETMISS tab in the student record visible for data entry. In the VET tab of the course record you can select the Qualification and the Units from the built in NTIS data for your chosen course. If your course is VET, but not from a training package or accredited course, you can also flag it VET here and allocate its Field of Education ID. This is something you may need to do as part of your government funding requirements for non accredited courses. Do you deliver state accredited courses? You will find the course listed in onCourse but not the modules that make up the course. This is because they are not publicly available on NTIS. You can send us the modules names, codes and field of Education IDs in a spreadsheet and we will manually add them to onCourse for you. onCourse does not contain the qualification packaging rules, so it is up to you as the RTO to ensure that you are compliant with your own scope of registration and the requirements of the training packages you are authorised to deliver. You should refer to these requirements when creating your courses and only select those units which are allowed to contribute towards that particular qualification. A full Qualification where you know all the units the students will complete in advance i.e. all students will complete the same core and elective units. Students will graduate with a complete Qualification. A full Qualification where all students will undertake the core units, but may all select different elective units. Students will graduate with a complete Qualification. A short course which has one or more units of competency embedded within it. The units may or may not all contribute to the same Qualification. Students will graduate with a Statement of Attainment. A short course where you know which qualification a student will be working towards in advance, but the students in the class will complete a variable number and selection of units. Some may achieve a Statement of Attainment, some may be working towards a full Qualification, and some may simply receive a non-vet Statement of Attendance. A course which is not linked to any national or state accredited training packages or accredited courses, but has a vocational learning outcome. Depending on your reporting requirements, these courses may also contribute towards your annual VET delivery. 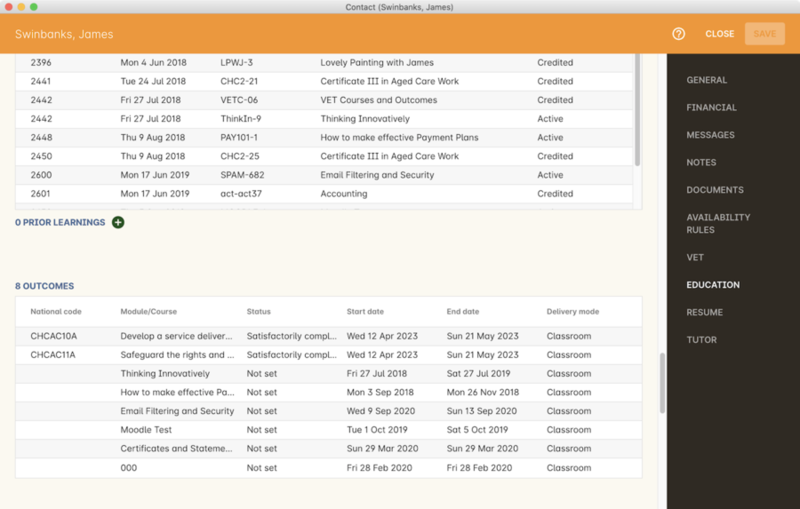 In onCourse outcomes (records of undertaking and achieving a unit of competency) flow down from the course to the student via an enrolment in a class. If a course has 15 units attached to it, when a student is enrolled in a class for that course, the student will have 15 outcomes created for them - one for each unit. You can always modify the units for the student in their own enrolment, for example if they change to a different elective. What this means is that you can save yourself a lot of data entry work if you set your course up with all the units to begin with. Follow the instructions to create a new course. Open the course record to the VET tab. Enter the National Code. 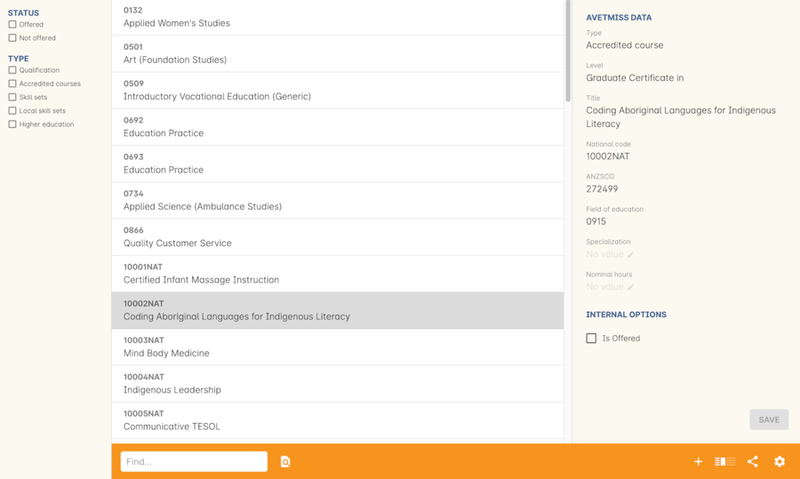 The fields are clairvoyant, so as you type in them, onCourse will search for and list the qualifications in the built in training.gov.au database. Select the qualification by clicking on it. You can also search for qualification by name in Qualification. Omit the words Certificate in or Diploma of in your search. For example, search for the Certificate IV in Aged Care by typing 'Aged Care'. You can then add modules and the units by clicking the +icon on the right hand side of the screen. This will open a drop down screen. Enter the National Code or Title These fields are also clairvoyant so make your selection and press ok. You will then be returned to the course screen where you will see the modules and units listed. To add more units simply click on the +sign and repeat the process. To delete any units, click the - sign. When you are done, click save. You can also set the nominal hours for the units as you attach them to the course. Once a course has a class with an enrolment in it you CAN NOT change the units of competency assigned to the course. This is because onCourse has created an immutable relationship with this data - if you changed it at the course level, every student ever enrolled in a class for this course would have their outcomes changed. However - you can always retire the old course and create a new course to use for future enrolment using the 'duplicate course' option in the list view cogwheel. The new course can have the same name but will have to have a different course code. You may choose to change the code of the old course instead, so the new course can use the existing code, which is adventagous for your SEO. Make sure to set the status of the old course to 'course disabled' and when you are ready, the status of the new course to 'enabled and visible online'. You may also want to duplicate one of the classes from the old course and assign it to the new course to use the same timetables and teaching schedules. You cannot actually add a Unit of competency to a course if it already has enrolments (see the caution above), you can only cancel the old course and then create a new course with the additional unit of competency you want included. This is because changing the units of competency changes the very nature of the course, but the history of the old course and it's previous students need to be retained. If needed, you can also add units directly to student enrolments. This will not change the course units for new students enrolling, but can be used to correct or update the records of existing students. If the unit change is substantial, you may want to consider creating a new class against the new course, and transferring all the students from the class linked to the old course to the class linked to the new course. This will remove all the old units from their record (provided outcomes have not yet been set), and with their new enrolment, add all the new units to their record. From the cogwheel, select the option 'duplicate course'. This will make another course with the same name and all the same content, with a course code with a 1 on the end. Courses can have the same name, but every course has to have a unique code. Because the course code is what forms your URL on the website, it is better for SEO purposes to change the code of the old course to something different before you disable it e.g. BCDCERTV could become oldBCDCERTV. Then you can change the code of the new version of the course from BCDCERTV1 back to BCDCERTV. Open the old version of the course and set the status to 'course disabled'. Open the new version of the course and make the required changes to the listed units of competency by adding or deleting from the current list on the VET tab. Note you will need to delete all the non-required units, save the record, and then reopen it to add new units. Open the class list view and locate a recent class from the old course. Following from the example before, this might be class oldBCDCERTV-90. Using the class cog wheel option, duplicate this class, making any changes to the dates as appropriate. This new class will have the code oldBCDCERTV-91 and be linked to the old course. Double click on the new class to open it. In the course code field in the top right hand corner, change the code from the old course to the new course e.g. BCDCERTV. This has now linked the class to the new course. Save and close. NOTE: You can only change the course a class is linked to before any enrolments are processed into the class. If a class has enrolments, even if those enrolments are cancelled, you can not change the course code it is linked to. When a course has the flag 'Satisfies complete qualification or skill set' checked on the VET tab, this means that if the student successfully completes all of the attached units, they will be eligible for a Qualification or Skill Set Statement of Attainment. Using the automatic 'create Certificates' options from the class or enrolment cogwheels will look at the value of this flag and determine what type of certification to create. This flag, for AVETMISS purposes, also signifies the student's intent to complete a qualification. Outcomes linked to a class with this flag checked will be reported linked to the parent qualification, where courses where this isn't selected will be reported as module only enrolments. This value of this checkbox can be changed as needed after the course has been created, and even after students have enrolled. Remember that in onCourse a course is about the product you are selling to your students. Sometimes you may break a program of study e.g. full qualification into lots of short courses for students to buy, complete and over time, to work towards the final outcome of a qualification. In onCourse, courses don't have to be linked to a qualification or a unit of competency. They can just be a non-accredited course. If students are working towards a unit of competency that they will complete in another course, you may like to indicate this in the program description that you use for marketing purposes. If the student only completes this course, they will only be eligible for a non-accredited Certificate of Attendance, not a Statement of Attainment. 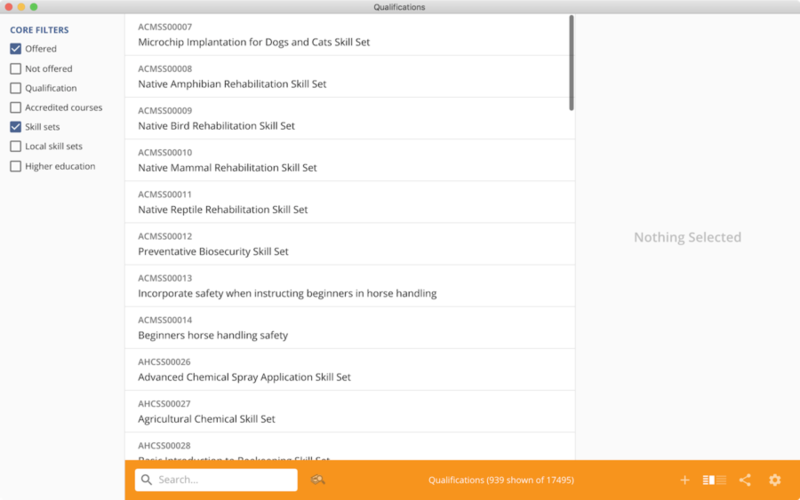 You can set up this type of program in onCourse by attaching the Qualification that the student will be working towards in the VET tab of the course, but not adding any Units of Competency to the course. You do not have to add the Qualification at all - this is optional, and would not be appropriate if the program of study never led to any formal Qualification outcome. When students enrol in this course, they will get a dummy outcome (used for reporting purposes in some states) with the name of the course. You can set this dummy outcome to pass (81) or fail (82). Using this outcome, you will then know when the student enrols in the next course (where the units have been attached) that they have successfully completed the part one component. When you set up the second part of the course, you will add the qualification and the units to the VET tab, so when the student enrols they will get the appropriate units of competency added to their record. Then you are able to record their final outcome result as per the standard list of VET options. In the example below, a student is working towards a cluster of units from the Certificate I in IT. Only when they have completed the second course, Understanding Computer Basics, are they eligible to be assessed against the unit outcomes. The first course, Computing Basics, has no units attached, and the second course has three units attached. 2nd course: The Qualification and Units are attached to this course. After completing part 1 and 2 the student can now be assessed. The student record shows a 'dummy' outcome for the course with no units. They have completed it successfully. Now they can be assessed against the other units.